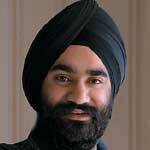 Rueben Singh combines technology and capital to help other entrepreneurs. He started his first business- a fashion accessories shop- at age 18, and four years later, as CEO of a retail chain, he was worth millions. Relying heavily on eight assistants, he realized that most other time-strapped entrepreneurs could use the same kind of support. So in 1999, he used $6 million of his own money to found alldayPA in Manchester, England. The company uses custom software that enables a team of live personal assistants to handle calls, manage calendars, type letters, and perform other tasks for business owners, whose customers need never know that the assistants are at a 650-seat around-the-clock call center. AlldayPA now has a database of 94,000 registered customers, who save money by not having to hire employees. Meantime, Singh’s Golden Fund, a $24 million war chest for acquiring and turning around ailing information technology companies, has aided more than a dozen businesses. The Bentley-driving CEO is helping other entrepreneurs through Dream On Attitude, a venture capital fund that invests his and other people’s cash in startups founded by innovators younger than 25.